That could be the case if the Kurdish YPG — one of the most effective forces in the U.S.-backed struggle against Islamic State extremists — succeeds in its goal of carving out a self-governing entity in the areas it controls in northern Syria. 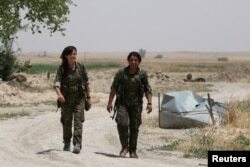 FILE - Kurdish female fighters from the People's Protection Units (YPG), operating alongside with the Syria Democratic Forces, walk in northern province of Raqqa, Syria, May 27, 2016. 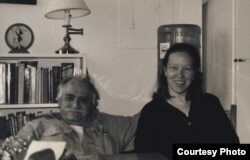 Bookchin's doctrine, sometimes loosely referred to as “democratic confederalism” or the “democratic nation,” has become a banner for the 2 million Kurds in Syria who have long sought autonomy from Damascus. 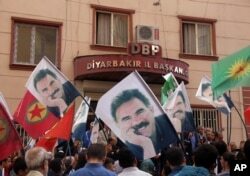 FILE - People hold posters of jailed PKK leader Abdullah Ocalan and PKK flags as they gather outside the headquarters of pro-Kurdish Democratic Regions Party, DBP, on the17th anniversary of Ocalan’s expulsion from Syria, in Diyarbakir, Turkey, Oct. 9, 2015. FILE - A Kurdish People's Protection Units (YPG) fighter walks near residents who had fled Tel Abyad, as they re-enter Syria from Turkey after the YPG took control of the area, at Tel Abyad town, Raqqa governorate, Syria, June 23, 2015. Kurdish military gains, largely made with U.S. air support, allowed them to declare a federal system of governance in 2015 in northern Syria — largely modeled on the thoughts of Bookchin. 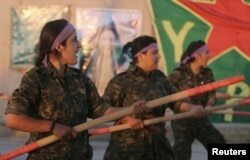 FILE - Kurdish female fighters of the Women's Protection Unit (YPJ) participate in training at a military camp in Ras al-Ain city in Syria's Hasakah province June 30, 2014.